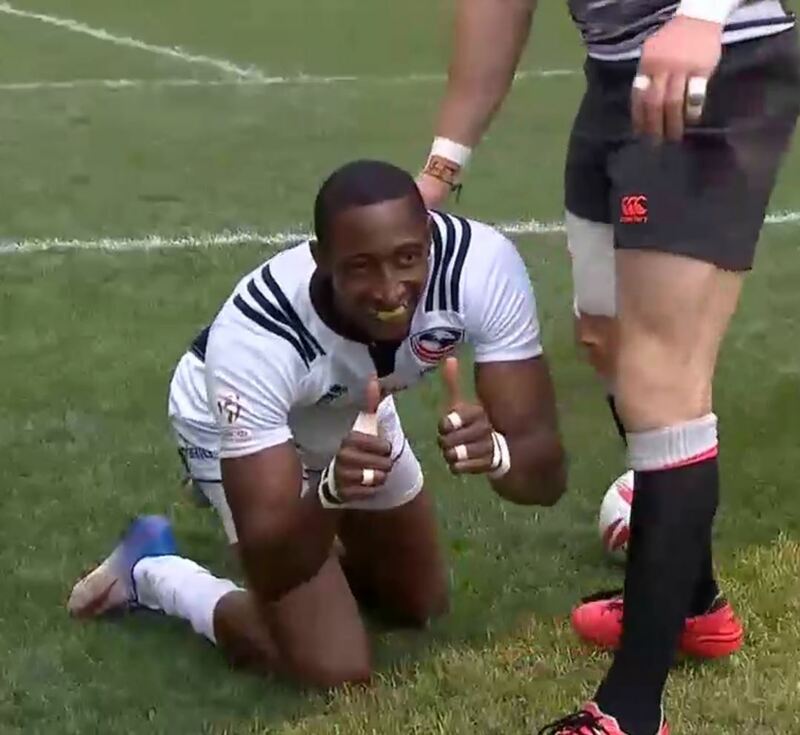 The USA 7s played in the Greatest 7s Tournament Of Them All last weekend, the Hong Kong 7s. Expectations are high for the lads from the States and they did not disappoint, going 3-0 in pool play with close victories over Russia and Scotland and a 33-5 dismantling of Argentina. There is no doubt who is the top dog in the Americas these days. This set up a difficult quarterfinal with England and it is well known to those who know it well that England is the only team that seems to have Series leader South Africa’s number as nobody else can find a way to beat them, so the Americans had their hands full. No problem. USA 27 – England 7. This was not the prettiest of games but it was won when the US relentlessly pounced on England’s mistakes. Dropped ball? Try. Knock on? Try. This is a sign of a very good team. It wasn’t that long ago that teams like England (and Fiji, and New Zealand, etc) would just sit back and wait for the inevitable US mistake and make us pay for it. The tables have turned. After this match this tournament started to get the feel of the magical run in the 2015 London 7s as our boys got stronger as the tournament went on. That tournament also included a date with South Africa and, no surprise here, we got the Blitzbokke in the semifinals. Again. If you have not watched that game go to the World Sevens Series website and watch the replay. Don’t worry, we will wait. Trust me, it is worth it. All done? Good. It’s ok if you need to take a moment and have a good cry. For the third straight tournament the USA has played South Africa in the Cup Semis and for the third straight tournament we have literally lost on the last play of the game. Yes, literally. In Las Vegas we were down a try and SA had a lineout in their end with no time left so we needed to steal it and we did – but got pushed over in the ensuing ruck and SA kicked the ball out to end the game. In Vancouver we were down a try with no time left (again) and attacking hard, stopped just short of the line when we drove over and were held up in goal. This time we were down a try with no time left (sensing a theme here) but instead of turning the ball over we scored sending the game into overtime! But once again, in overtime a critical mistake led to a SA try and we lost on the very last play. We are soooooooo close. Mike Friday had better have his sports psychologists working full time to get us over the mental block that is the South African Blitzbokke 7s team. As they say in Cape Town, amper, maar nie stamper. Last week we referred to Steve Hiatt as the poor man’s Paris Hilton. This is incorrect. Steve is actually the poor man’s Alice Sheets Marriott. We also incorrectly referred to Mr Hiatt as the Head Coach of CSUMB. He is actually the Head Coach of the California Maritime Academy. Hail Pelicus regrets these errors. Does This Tournament Make Me Look Fat? * Buggered if I know. The pools for next week’s Singapore 7s have been announced and the USA is drawn with New Zealand, Scotland and Wales. A tough pool indeed, but that isn’t the story. The USA is the top seed in that pool. Let me repeat that. The USA is the top seed in their pool. A pool that includes the All Blacks. Go ahead and lie to me – tell me you ever expected to see that. It is playoff time again and many of us will be called on to adjudicate these matches. Please note that quite often matches will be listed by seeds, so the game will be something like Pacific #3 vs South #1 or Winner Match 3 vs Winner Match 1. When writing your report narrative please make sure you explicitly identify which team is which so that I can update the team names in our reporting section below. Many thanks to those who did playoff matches already who have made my life easier. When needed fill it out and click submit. The discipline chair of the competition you refereed will receive a notification about the incident. He/she may contact you latter for more details. Coming off of two hard fought playoff matches at Brown in consecutive weeks, I was looking forward to a friendly, good ‘ole rugby match. But then I remembered, there’s a trophy on the line. The Rhody Cup, passed between colleges in Rhode Island, Ranfurly Shield style. So, this was gonna be a match. The weather was cool and pleasant for a New England spring, although a strong wind made kicks for posts, restarts and touch very challenging. More than a few kicks to touch didn’t make it and I even had the most fun restart kick making it 10m in the air and then blowing back 3 meters. Confusion set in regardless of my calling ’10m, play on!’ Never saw so many deer-in-headlight stares all at once. Both teams play in New England D2, so it was a step slower than my two former D-1AA playoff matches. Either way, the pace was equal on both side but eerily reminiscent of Brown v Yale where both teams were equal in size and fitness, but URI out rugby’d the Friars. And unfortunate yellow-card tip tackle by the URI fullback at the end of the 1st half saw advantage played until PC scored a try. The second half was URI scoring tries in the first 20, then PC answering back with a few to gain momentum. One try at the 75th minute saw my favorite fullback chase a breakaway runner to the 5m line, jump high and brought him down by the shoulders. Penalty try/yellow card/red card. This player does not seem to want to finish a half. URI took the cup from PC and will retain it until the fall. I also took on the B-side match that saw URI win 54-0. Cal Poly struck first by making good use of two penalties in front of the post. Game was fast and close in the first half. Both teams contested hard at the breakdown and attempted to spread the ball wide in the middle of the field. Cal Poly had a far superior scrum but San Diego had cleaner play in their back line and were able to pull away in the second half. The day was cool and overcast with a chance of rain in Fresno. The previous wet days softened the Valley hardpan and greened up the grass nicely. Fresno started the scoring at 7 minutes in with a converted try. The Diablo Gaels matched 3 minutes later. Both teams trade penalty kicks to even at 10 a piece. Then Diablo started opening up with some punch kicking that rewarded them 2 unconverted trys with about 10minutes to go in the first half. Fresno rallied back to the 5 meter where Diablo’s ball killing tactics gave Fresno a converted try. At the ensuing kick off, a couple neat passes and a long sprint put Fresno ahead with a converted try, with 4 minutes to go. Fresno 24 Diablo 20 at half. The rain started to fall as Diablo kicked off. Fresno made quick work to open the second half, with an unconverted try at 2 minutes in. Fresno defended Diablo’s kicking game well at this point, by scoring in the corner at 10 minutes. Try unconverted. Diablo, never out of the game, pounded their way back through Fresno territory to score an unconverted try 3 minutes later. The battle continued between the 22’s for the next 12 minutes, until Fresno found themselves on the five meter going in. Two minutes of hard bashing earned Fresno another unconverted try. Both teams played a desperate game of protect and advance with Diablo scoring a converted try with seconds left. Spring ducked behind the rain clouds this past weekend in Sacramento. The Blackhawks home field was washed out. Due to some fast leg work, Ben Parker secured a patch of grass behind a local high school. While sloshy and soft underfoot, the field was very playable. BA needed a win to secure a playoff birth. Blackhawks were hoping to secure a #2 seed. There was a sense of urgency and focus from both teams. Unfortunately, the wet led to a lot of dropped ball = lots of scrums throughout the game. The first half was both aggressive and athletic with some lovely kick and chase work on both sides. For a few minutes some tempers flared leading to a no wrap (yellow card) tackle however both captains were responsive and players cooled and refocused. Blackhawks scored twice to BA’s one, plus a penalty goal. 12-10 at half time. The second half saw a change of tactics from BA for a while as they began to not contest rucks. The pace picked up and the game opened up for a while. The Blackhawks score twice in the second half to one BA try. The last game of the quarter finals meant that the last hail shower of the day had passed through. The fields were well marked and held up well to the days play. The game started well with periods of pressure from both teams, culminating with the first Colusa score at 17 minutes, followed by another three minutes later. Reno hung in for the remainder of the half but still reached half time 28 – 0 down giving up four scores. The second half saw Reno tire pretty quickly and with Colusa running hard, direct lines it became a procession of Colusa scores – 9 tries but only four of them converted with a single Reno try, also unconverted. 4 seasons in 1 day — sun, rain, hail, back to sun again — reminded me of home. Pitch was in excellent shape in spite of recent rain, and the two sides went at it hammer and tongs. Game was a lot of fun, even with a couple of incidents of foul play, and Marin kept hammering away to the final whistle, and were unlucky in the end not to get on the scoreboard. Initially marked by some heavy hits. Boorish behavior seemed the norm as Empire held off San Joaquin at the end. The final match of the regular season ended with San Jose vs Berkeley. This was a very close match. The first half was a complete stalemate. The only scores coming minutes of each other. Each scoring around the 14 minute mark. And we headed into halftime tied 5 a piece. The second half was not as kind to San Jose. Berkeley seemed to be to have more wind in their sails. They scored 3 times twice by their 15. This pushed them over the top in today’s game. San Jose did manage to add a late try to bring the final to 10 – 22. The standout players from each side were the full backs. As a former forward, nothing pains me more than to say that. They scored 4/6 or two thirds for all you math nerds out there, of the tries. The ladies didn’t seem to mind the weather and were ready for some rugby. Colusa showed up with 10 so we decided to play 10s. San Jose had a few subs and the extra legs helped them with what was a convincing victory. They scored early and often in the first period as Colusa struggled to get out of their half. First and second phase tackles were made but as the ball was recycled the defense got more out of shape and gaps appeared. Seahawk scrum half Angela Silva has developed a nice sidestep to compliment her game and she used it to great effect, leaving defenders grasping at air. Halftime score was 37-0. The second period was a different story, however. Colusa’s team talk at the break must have stiffened a few resolves as they came out the more aggressive side and pressed the action. Several breakaways were left wanting due to bad passes and knock ons but they finally got their just reward with a well worked try. San Jose was able to score one of their own but the second half ended with honors all even and a final of 42-5. SFGG controlled the game with set pieces and moving the ball out wide. EPA scored all of their points in the first 15 minutes of play. After that it was all SFGG. A fool’s errand, I thought as I drove through the pouring rain to TI for this early match. But at the Bay Bridge, blue skies broke out. As did an excellent match. This was listed as a ”friendly”; not so friendly on the pitch. I recently commended a men’s team on its tackling, Well, the tackling in this one was better. Play of the game-a 110 lb Blues fullback absolutely nailing a 160 lb Gate flanker (I think) to save a try. A thing of beauty. Blues score early (6 minutes) and late (35 minutes) in the first half, but only put it away with a third try at about 60 minutes. Gate banged away all day with fervor within the Blues 22, but no success on this day. USA’s Perry Baker gives 2 thumbs up to Hail Pelicus readers after scoring against England in the Hong Kong quarterfinals. He is a big fan. This entry was posted in News on April 13, 2017 by James Hinkin.